With only one airport, there are no domestic flights within Luxembourg. As in the rest of Western Europe, there is an excellent network of roads and motorways in Luxembourg. Motorways are designated as A1, 2, 3 etc. Trunk roads are designated as N1, 2, etc. Regional roads as CR1, 2, etc. All the main agencies operate in Luxembourg. Most of the rental offices are located inside the Findel airport terminal. Taxis are metered, but expensive. There is a minimum charge and a 10% surcharge is applied from 2200-0600. There is also an extra 25% surcharge all day on Sundays. Taxis are plentiful in Luxembourg City (rarer elsewhere) but cannot be hailed in the street. A 10% tip is usual. You can hire bikes in most towns. Ask in the local tourist offices for more information. You can borrow bikes for a short duration for a small fee (free up to 30 minutes) from vel’oh! stations dotted across the centre of Luxembourg City, but you must first register for this service via the website (www.veloh.lu) and pay a deposit. In the Moselle Valley, RentaBike Miselerland (www.rentabike-miselerland.lu) has around a dozen rental outlets, and you can return bikes to any site. The minimum age for driving is 18. The wearing of seat belts is compulsory in the front seat and in the back, where seatbelts are fitted. Children under 12 years of age must travel in the back seats, unless they are 1.5m (5ft) or taller, or if the front seat is fitted with an appropriate ECE-approved child seat. Motorcyclists must use a dipped beam even by day. Cars must be fitted with winter tyres during conditions of sleet or snow. You must carry reflective clothing in your car in case of a breakdown. The speed limit is 50kph (31mph) in built-up areas, 90kph (56mph) outside built-up areas, and 130kph (74mph) on motorways, except where otherwise stated. Automobile Club du Grand-Duché de Luxembourg (tel: 26000, emergency number in Luxembourg only or +352 450 0451; www.acl.lu). Third-party insurance is necessary. A Green Card is not obligatory but is strongly recommended. Without it, you only have the minimum legal cover in Luxembourg (if your have motor insurance at home). The Green Card tops this up to the level of cover provided by your domestic policy. For most nationalities a valid national driving licence is sufficient. Luxembourg City has municipal bus services, for which you can buy single-journey flat-fare tickets or all-day tickets. 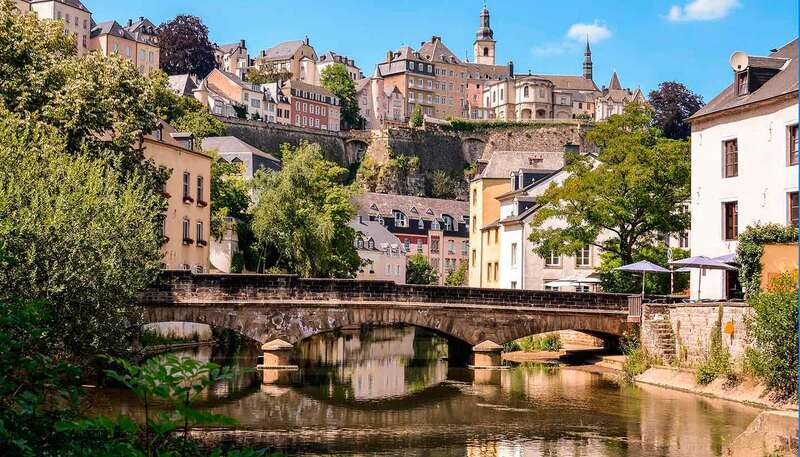 The former 'short-duration' ticket is valid for two hours from purchase on the whole of Luxembourg's public transport network, and also allows transits between city and country buses and trains. Ten-journey tickets are also available, but you must buy these advance. A comprehensive network of public buses connects most towns and villages. Tickets are also valid on domestic trains. The national railway company, Chemins de Fer Luxembourgeois (CFL) (tel: +352 2489 2489; www.cfl.lu), runs an efficient rail service which is fully integrated with the bus network. CFL has a so-called horaire cadencé schedule, meaning there is at least one train every hour to every station at the same time in every hour. Reductions are offered for weekend and holiday return tickets. Domestic trains are cheap and run regularly, but also slow (although distances are small). Luxembourg Card: gives unlimited travel on public transport for a period of one to three days, with free entrance to up to 40 attractions. Day Ticket (Billet Longue Durée): a single-day ticket for unlimited travel until 0400 the next day, on all forms of public transport (not valid on sightseeing buses), with concessions for senior citizens. For further information, contact CFL. The only commercially navigable waterway in Luxembourg is the Moselle River. The MS Princesse Marie-Astrid offers daily pleasure cruises from Easter to September, but one-way travel is also permitted. See www.marie-astrid.lu for fares and timetables.